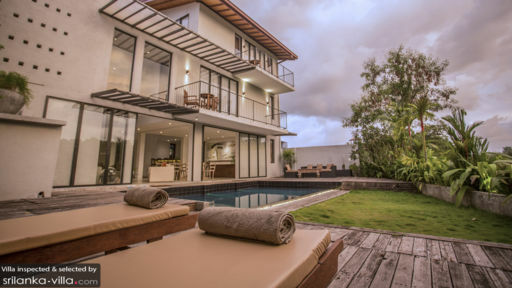 Found in the centre of Colombo, the capital city of Sri Lanka, The Mangrove Villa is a four-bedrooms holiday home with splendid views that pan across a land occupied by mangroves for an almost other-worldly experience. Connecting with nature was never easier than at the villa since you’re steps away from raw nature even when you’re in the city, thus, you have the best of both worlds. Traditional interiors comprising furniture crafted by skilled Sri Lankan masters grace the rooms and living areas at the villa. Enjoy a restful and rejuvenating tropical getaway with loved ones! Mangrove Villa is home to four beautiful bedrooms that have been named as exotically as they are designed – Allure, Flame, Lily, and Oasis. Allure suite is the master bedroom suite with a king-sized bed with a deluxe mattress, spectacular views of the mangroves, as it adjoins to a balcony, and luxe interiors. It even has a living/work area with a plush sofa bed, a work desk, and LED TV with Blu Ray player. The en-suite bathroom is equally luxurious with dark interiors coupled with a bathtub and shower area. Flame is the colonial suite with a four-poster, king-sized bed, Lily is the Signature Room sporting shades of the Mangrove villa – purple and black, and finally Oasis is a luxe bedroom with comfortable, inviting interiors. Each of these are furnished with deluxe beds, LED TVs, Blu Ray players, and quality bedding. There are en-suite bathrooms with each bedroom that have been fitted with bathtubs/ tropical rain showers and vanities. As far as the eye can see, lies the luscious, tropical foliage around Mangrove Villa with dense bushes, thickets of trees, and mangroves. 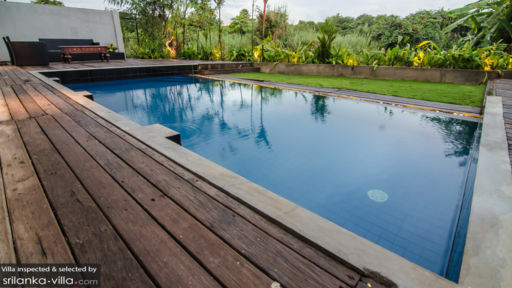 The verdure of the tropical vegetation is almost magical and to your advantage since you can enjoy it limitlessly as you lounge on the timber pool deck. There is a lavish swimming pool that is an infinity-edge as it reaches into the natural greenery. Enjoy a fresh and delicious coconut, water and skin, as you relax on the outdoor sofas that are found on the deck. If you’re one to stay indoors, then the poolside living area serves just the purpose with its comforting and warm interiors featuring antique and rustic furniture, hand-picked artwork that is immediately inviting, as well as a serene ambiance owing to the tropical breeze. The elegant furnishing truly enhances the charming ambiance. Lampshades cast a warm hue around the room making it even more homely. There are plush couches, slouchy armchairs, wall hangings, and artefacts that create a wholesome, Sri Lankan atmosphere. For dining purposes, the villa provides an eight-seater dining table which is part of the living area, and also looks out to the pool. A beautiful piece of art dons the wall beside the dining table, and the tasteful setting is an experience in itself. There is a fully-stocked bar at the villa as well, serving a variety of cocktails and drinks that you can enjoy, especially once the sun sets and the wind becomes a bit nippy. The villa features a front desk which is open to your requests and queries, so you have everything you need. 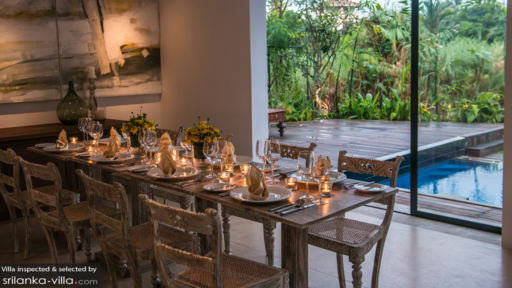 Offering catered services to guests the villa is fully-staffed and even provides an a la carte menu and a specialised menu to take care of your meals for you! The best way to know a city is to explore it on foot or take a tour across the many attractions. Head to Dehiwala Zoo to meet the cat family, or the city centre to observe the soaring Clock Tower, and if you feel like shopping then the Pettah Floating Market is the place for you. Many ancient temples and other places of interest like museums and the glittering Parliament of Sri Lanka can be seen through an excursion into town!